The Eaglehawk Neck Historic Site occupies most of the narrow ‘Neck’ of land that separates Pirates Bay and Eaglehawk Bay. 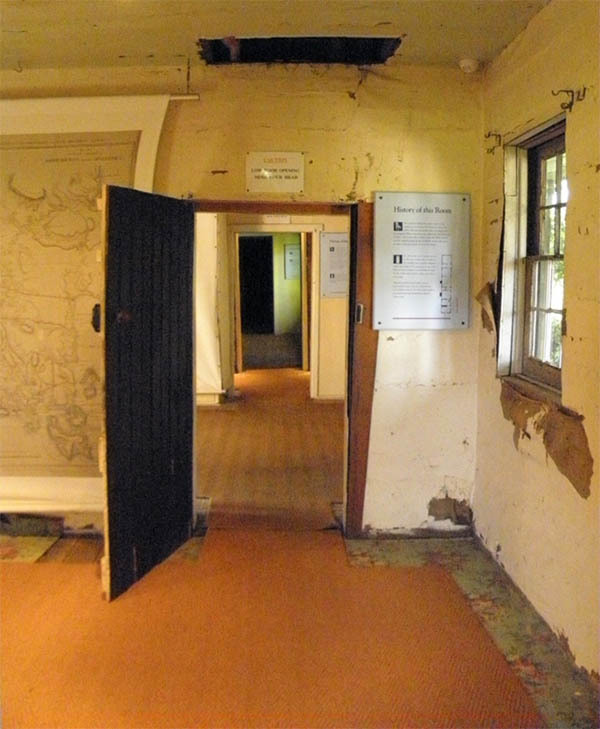 It offers visitors a unique perspective on the security system which operated throughout the Tasman and Forestier Peninsulas during the convict period. Photo: Arthur orchard – guarding the ‘Neck’. It includes the infamous dog line, installed to prevent the escape of prisoners from Port Arthur, while a semaphore station provided communication with the rest of the peninsula and Hobart. A jetty stretched some 300 metres into Eaglehawk Bay to enable supplies to be offloaded for the garrison, and guard’s huts lined the bay as added security. The system proved quite effective in achieving its purpose; however, it was not enough to prevent the escape of the infamous Martin Cash, who was to become one of Tasmania’s best-known bushrangers. 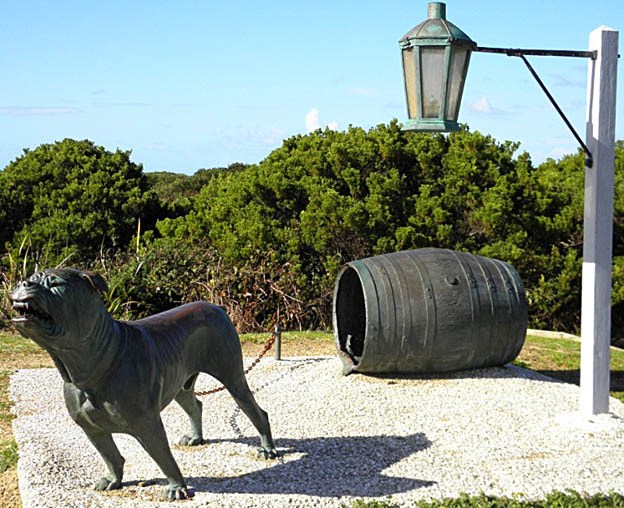 A bronze sculpture of a dog with its barrel-kennel and oil lamp is now a feature on the Eaglehawk Neck Historic Site, near the Community Hall. Photo: Arthur Orchard – Officer’s Quarters – a bit overgrown but well worth a look. Today, the only building which survives is the Officers’ Quarters, erected in 1832. It is thought to be the oldest surviving timber military building in Australia. The building has been partially restored and now acts as a museum and interpretation centre. Arthur Orchard – one hundred and eighty five years of use has taken its toll. The Officer’s Quarters are all that is left of the original convict era garrison on Eaglehawk Neck. It housed just one officer and his family. Other buildings housed a sergeant and twenty soldiers. The garrison included a store, guardhouse, several sentry boxes, a semaphore station, the infamous dog line and a jetty stretching some 300 metres into Eaglehawk Bay. Several Constable’s huts were located on either side of the bay to guard against escapees crossing the ‘Neck’. By 1856 the garrison numbered thirty to forty men. Ref : ‘Ian Brand (1998), Penal Peninsula, Regal Publications, Launceston. The Officer’s Quarters is part-period furnished and open for inspection from 9am to 5pm daily, with free entry.